Have a 2012 C14 with Canyon Cages. 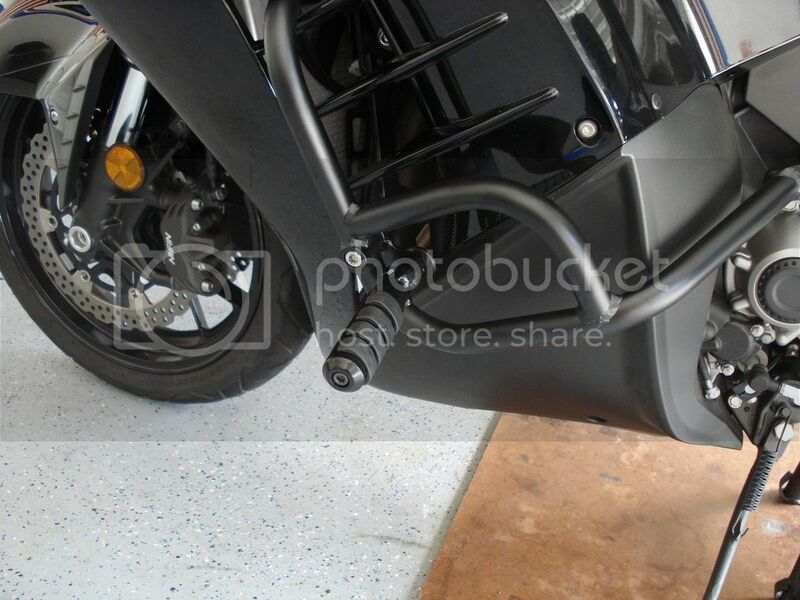 Was looking at my options to attach Hwy pegs to give my legs a break. Did not love the idea of attaching something to the bars. Did not look that clean and was also concerned about those types of clamps rotating if tipped over. Came up with an idea that I think fits the bill. I am 5'10" tall with a 30" inseam. The location is perfect for me (slight bend at the knees). If you have longer legs and want your legs straight then you can rest the back of your boots on them as well. They take about 60 seconds per side to install. If you do not like the way they look you can just put them on for your longer trips. I am using the Rivco black vibration isolating pegs on my hardware. The other thing I like about them is they will not touch during a "normal" tip over but with more momentum I believe they will stop the bike from rotating a lot more and getting your rear view mirrors. Was really just making a pair for myself to solve a problem but others might have interest as well. They will only fit 2010-2016 C14 with this style of Canyon Cages. If you have some Rivco Black pegs already then the cost for the hardware (comes in black or black) is $40 plus $6.95 shipping in the CONUS. If you want or need the pegs, the entire set (Rivco pegs and Hardware to mount them) would be $95 plus $9.95 shipping in the CONUS. Lifetime replacement on the hardware (my lifetime not yours). if you have a problem, return the hardware to me first, and I'll replace it. If there is a fair amount of interest it will be a couple of weeks before the first set ships. After that they will be ready to go. PayPal is the preferred method of payment. PM me if you have questions or anything else. Thanks. Do they come in a Chrome version? I think the pegs do. The attach hardware does not, but there is such a small amount that you can see you can just paint it silver. There is maybe 1/3 of a inch visible between peg and Canyon Cage. Do those bolt in? Hard to see in the picture. Remove bolt that came with Canyon Cage. Install new bolt/stud. That is it. It is as clean as it gets. 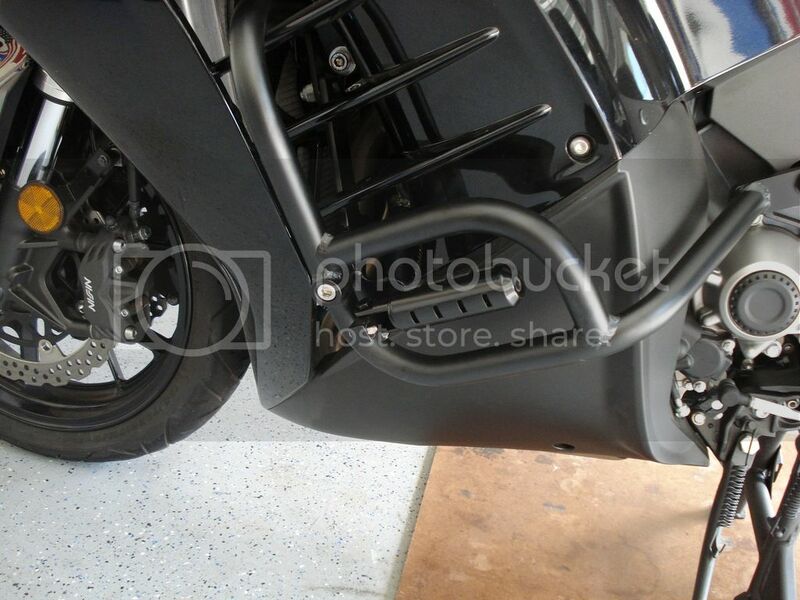 Looks nice, but the problem that I foresee is when you drop your bike, the peg is going to take all the impact, possibly snapping or bending the bolt and making removal of damaged peg very difficult. I originally thought that might be a problem. So after I installed them i put the bike down with help on some cardboard. The end of the pegs clear the ground by 1 1/2" . Contact is made with the bottom of the bar as CC intended. But I think in a a higher momentum drop (aka crash) it might contact them. To me that is good because on those higher rate drops the mirrors usually contact (more expensive). In any case the stud part is 3/8 grade 5 bolt and even if it got slightly bent you can just put a vise grip on it and turn it out. You have a 1.25" long stud. It is solid and do not think it can get stuck unless you destroy the bars at the same time, and that's a whole other story. I did something similar to you.. I made some brackets but where did you get the studs from? I would prefer mine to look like yours instead of being on a bracket.. I Can Only Please One Person A Day.. Tomorrow Doesn't Look Good Either. Made the bolt/stud. Does your set up rotate at all? Debs, I LOVE the flowers!! Nicole - did you weld that bracket to the cages? Nicole, That's SLICK! Recessed, I like it a lot. I hope you don't mind if I steal that idea. Flat-spot, by all means, please do so. I am glad that you liked it. By the way, I hope you dont have a difficult time remembering your COG member number . Dam thats a fantastic idea......love the bracket.....did you make the bracket or find it somewhere, and/or modify it to the application? let the secret out....!!! That looks great. Is the bracket custom or did you purchase it. Can anyone confirm the info below is the correct peg for doing this? I'm interested. I would like to see just a picture of the mounts that I would be buying though. I like to know exactly what I am getting. Couple of close ups of the Bolts that make up the attach hardware. Bolts are undercut at a 30 deg angle and then welded together. Used them the other day and they work great. A note about the other attach methods in this thread. 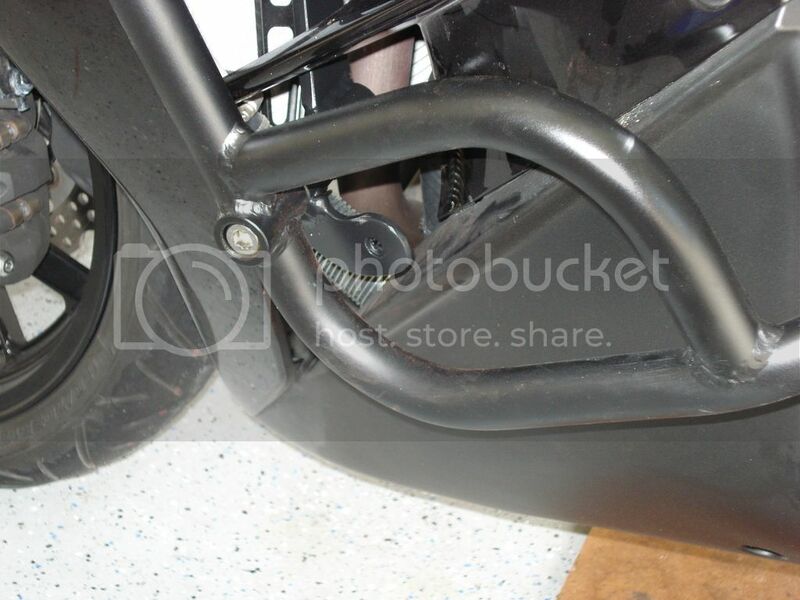 If the Hwy bars are mounted any further inboard it becomes difficult to get your feet on them without your legs being hard up against the fairings. Are the bolts stainless to prevent them from rusting? Not stainless. Painted black. Even if I used stainless the welding would ruin the properties of stainless. After installation I just use a little flat black on it. Doesnt welding also ruin the hardness properties of the bolt? Page created in 0.414 seconds with 25 queries.